The name C. cinerea longispina alba identify a rare long white (at least when young) spined form. that can be referred to a form or clonotype within the variability of Copiapoa cinerea. This species shows great variation and it is sometimes difficult to separate one local form from another. Many of this forms have received unnecessary names. The variety "longispina f. alba" should be distinguished by its more long creamy-white or grey spines (at least when young). Habit: Copiapoa cinerea is one of the most admired species of cacti with chalky/white stems covered with wool at the apex, which contrasts well with the sparse, jet-black spines. It is a solitary, or slowly offsetting, globular to columnar cactus. Stems: Up to 1,2 m tall, 10-20 cm in diameter. The white colouration is a waxy coating presumably to prevent dessication in it's extremely dry environment. In cultivation the white waxy bloom is often not produced, revealing a brownish epidermis. Radial spines: 0 to 7 of the same colour. Notes: It is a very variable species as demonstrated by the number of varieties and their synonyms. The several classifications and reclassifications provide evidence of the confusion that rules regarding the names used in this highly variable species. It seems that many botanists and hobbyists who have studied Copiapoa in habitat have formed their own concepts of which names should be applied to which plants. It is relatively easy to attribute some key features that dominate in certain populations, but it is equally possible to look more closely at plants in these populations, and find individuals that 'break the rules' and would easily fit another population's dominant characteristics. 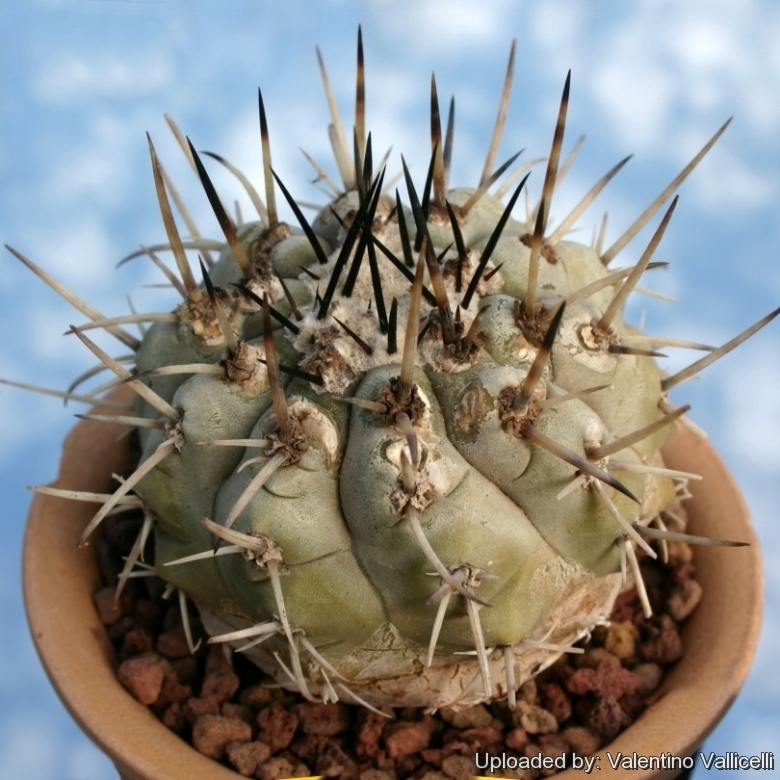 Cultivation and Propagation: Considering that Copiapoa cinerea comes from a habitat with an extremely arid climate, they are remarkably tolerant of pot culture. These plants have taproots and are susceptible to overwatering. They requires also an appropriate air circulation. Copiapoas are summer grower species easy to cultivate.